Variants of the 1620 Mayflower Compact frequently excluded the names of the forty-one signatories of that accord, yet for those instruments that furnished this list, the spellings were anything but consistent. This variance was also evident in the few references to the appellations of the Mayflower participants found in the 1621 Conference and Agreement Between Plymouth Colony and Massasoit, Wampanoag Sachem. In particular, Levenshtein edit distance analyses assessed these Compact name disparities and the texts of that manifesto, and examined the provenance of its later renditions. A significant correlation between observed pairs of text and signatory list errors was also found. The Mayflower Compact is one of America’s fundamental historical documents. The aspects of religious freedom associated with the members of the Mayflower voyage  are now eternally embedded in the First Amendment of the Constitution: “Congress shall make no law respecting an establishment of religion, or prohibiting the free exercise thereof; or abridging the freedom of speech, or of the press; or the right of the people peaceably to assemble, and to petition the Government for a redress of grievances” (The Constitution of the United States of America, 2004, p. 1013; emphasis added). The document itself is brief, just less than 200 words (henceforth, the Compact; see Appendix I), and it has been used faithfully by historical commentators as a vehicle to chart the basis of a national philosophy of the United States. However, as Sargent (1988, p. 251) made clear in the subtitle of his analysis, “the rise of the Mayflower Compact in American myth” has become an integral part of the political framework constructed upon these few words to first create, and then to sustain, two potential cardinal precepts of America: “the principle of a democratic church and the principle of a democratic state.” As Parrington remarked, while the first concept flourished, the plantation covenant underlying the second option was rejected a decade later by the Massachusetts Bay colony (1927, p. 17). Such a treasure, one might expect, would be well perused and secured for the future, but just as with the United States Constitution, the Compact has been altered, either knowingly or not, so that the fidelity of the available texts of this important document has been compromised. There is an immediate indication of this distortion: the said Edward Leister has had his surname spelled as Leicester, Leister, Lester, Liester, or Lister. As will be seen, it is small wonder that only ten of the forty-one signatories (= 24.4%) had names that went unchanged across thirty-four studied manuscripts. This variability is particularly unfortunate if this instrument warrants the respect that Philbrick contends. Certainly, the Compact does not possess the same cachet as the Declaration of Independence or the United States Constitution. For example, there are no corresponding document-related stories to parallel that associated with the one involving John Hancock: “His florid signature beneath the Declaration of Independence — which according to folklore he inscribed so large that King George could read it without his spectacles — is so famous in the United States that ‘John Hancock’ has become a synonym for ‘signature’” (Pencak, 2004, p. 17; emphasis added). Such boldness — or disregard — became a critical component in the development of American mythology and so readers ever since have been driven promptly to the bottom of the Declaration to inspect his commitment. This has not been the case with the Compact. Indeed, there are a large number of variants of this instrument without any corresponding list of Pilgrim signatures, or in some cases that have only supplied the endorsers’ list as a footnote. Some of those men attained marked status after the Compact was created and are thus less well known for their attempt to form a documented, organized settlement. Once ashore, the Pilgrims faced subsistence and security issues. The text of the 1621 Conference and Agreement Between Plymouth Colony and Massasoit, Wampanoag Sachem (Mandell, 2003, p. 23; hereafter, the Conference) identifies one of the earliest attempts of treaty negotiations between the aboriginal people and the invaders of America to address this latter concern. The history of this contract has become lost within the development of Pilgrim and Thanksgiving lore (see Pleck, 1999 and Wills, 2003), but it was an important diplomatic event for both the residents and the intruders. Salisbury (1985, p. 451) remarked that the Indian population of New England was devastated by disease in the late 1610s through “New England’s first such epidemic, usually identified as a strain of plague,” from which 50,000 died; widespread small pox was to arrive in 1633. Townsend (1938, p. 482) concluded that “[o]ne reason the Puritans were allowed to settle so peacefully was that the near-by Indian village had been abandoned because of the epidemic.” This overall weakening of the local tribes — particularly those living around Plymouth where the Mayflower passengers settled — meant that an alliance formed with these settlers as a way to fend off antagonistic traditional enemies to the west, and so Massasoit was enthusiastic for such an opportunity (Salwen, 1978, pp. 170-172). This new perspective of a mutual interest in terms of shared security imparts more meaning and insight to the few Conference words below. Suddenly, a document parameter regarding an “unjust war” against Massasoit’s people, or that expresses the need for Massasoit to inform “his neighbour confederates” of the Conference transaction, or that cautions against any visits by armed men better presents the environment of the contentious world of New England in 1621. The concerns for peace through cooperation were no different in the seventeenth century than they are at the present time. The available renditions of this negotiated document were derived from one section of an early journal kept by the citizens of Plymouth that recorded their activities after their arrival in November 1620. The Conference title used by Mandell is a modern addition; his citation refers to that earlier collation (i.e., to Mourt’s Relation; see Bradford, Morton, Winslow, and Cushman, 1622, pp. 32-39). The term agreement may be a more accurate description of the outcome of these interactions, but the net effect was twofold: the two parties reached a six-point agreement (p. 37) that increased their joint security, and those Plymouth signers could only have been members of the Mayflower contingent that had arrived in the previous Fall. “1. That neyther he nor any of his should iniure or doe hurt to any of our people. 2. And if any of his did hurt to any of ours, he should send the offender, that we might punish him. 3. That if any of our tooles were taken away when our people were at worke, he should cause them to be restored, and if ours did any harme to any of his, wee would doe the like to them. 4. If any did vniustly warre against him, we would ayde him; if any did warre against vs, he should ayde vs.
Mandell (2003) conveyed virtually the same text, save for modern spelling that converted iniure to injure in parameter 1; vniustly to unjustly in parameter 2; leaue to leave in parameter 3; and the four instances of vs to us in parameter 4, 5, and 6. “1. That neither he nor any of his should injurie or doe hurte to any of their peopl[e]. 2. That if any of his did hurte to any of theirs, he should send the offender, that they might punish him. 3. That if any thing were taken away from any of theirs, he should cause it to be restored, and they should doe the like to his. 4. If any did unjustly warr against him, we would aide him; if any did warr against them, he should aide them. 5. He should send to his neighbours confederates, to certifie them to this, that they might not wrong them, but might be likewise comprised in the conditions of peace. “1. That neither he nor any of his, should injure or harm any of their people. 2. That if any of his did any harm to any of theirs, he should send the offender, that they might punish him. 3. That if anything were taken away from any of theirs, he should cause it to be restored; and they should do the like to his. 4. If any made unjust war against him, we would aid him; if any made war against them, he should aid them. 5. He should send to his neighboring confederates, to certify them of this, that they might not wrong them, but might be likewise comprised in the conditions of peace. “1. That neither he, nor any of his, should injure, or do hurt, any of the English. 2. That if they did hurt any of ours, he should send the offender, that we might punish him. 3. That if our tools were taken away when our people were at work, he should cause them to be restored; and if ours did harm to any of his, we should do the like to them. 4. If any did unjustly war against him, we should aid him; if any did war against us, he should aid us. 5. He should send to his neighboring confederates, to certify them of this, that they might not wrong us, but might be likewise comprised in the conditions of peace. “1. That neither he nor his, should injure any of ours. 2. That if they did, he should send the offender, that we might punish him. 3. That if our tools were taken away, he should restore them; and if ours did any harm to any of his, we should do the like to them. 4. If any unjustly warred against him, we should aid him; if any warred against us, he should aid us. 5. He should certify his neighboring confederates of this, that they might not wrong us, but be comprised in the conditions of peace. Clearly, the text evolved in simple but meaningful ways. It is also important to acknowledge that, commencing with the publication of Mourt’s Relation, an extra or seventh treaty parameter regarding Massasoit’s transaction was incorporated by some authors into their renditions of the Conference. This proviso stated “[t]hat doing thus, King James would esteeme of him as his friend and alie”; see Dexter (1865/1969, p. 38/94). The footnote in Bradford’s History (1912/1968, vol. 1, p. 201) remarked that “[t]here is an additional clause in Mourt, which, however, can hardly be considered one of the articles to the treaty,” but while perhaps not integral to the transaction, such supplemental portions have proved beneficial when a document’s provenance is investigated. Further, these limited exemplars of the established terms of the Conference transaction are particularly effective to illuminate the degree of variation in just these few sentences. Brigham (1836, p. 304) listed all seven articles, with a footnote that pointed to Judge Davis’s edition of Morton’s Memorial. Unfortunately, the first journal to provide these Conference declarations — customarily called Mourt’s Relation after the second author, George Morton — did not attach a list of either the signers of the Conference document or of the earlier Mayflower Compact. Later variants of Mourt’s Relation (see the edited work of Dexter, 1865/1969, pp. 3/7-3/8) remarked that the eldest son of George Morton, Nathaniel Morton, published four decades later the names of the Mayflower passengers (see Morton, 1669, pp. 15-16). Succinctly, the identification of those voyagers not only linked their entrance into the New World, but it did so with regard to the onset of formal American Indian affairs, at least within the area that became known as New England. Consideration of the agreement description and of Morton’s 1669 roster of forty-one signatories of the Mayflower Compact furnishes the names of the participants in both domains. “did likewise choose our Governour for this yeare, which was Master John Carver a man well approved amongst us” (Bradford, Morton, Winslow, and Cushman, 1622, p. 33, 35, 36, 36, 38, and 39, respectively; emphasis added). Here, master Williamson is identified by Ames: “It is, therefore, not too much to assert that the MAY-FLOWER carried a ‘ship’s-merchant’ (or purser), and that ‘Master Williamson’ was that officer” (1907, p. 140). Further, the possible pairings of the Conference’s Winsloe and Alderton with the Compact’s Winslow and Allerton illuminate the variability of this set of surnames in these two initial sources, absent the supplemental issue that Allerton’s forename was spelled by Morton (1669, p. 15) as Isaac, instead of Isaack, as found in the Conference. Nevertheless, five or 12.2% of the forty-one recognized signers of the Mayflower Compact — Steven Hopkins, Captaine Standish, Edward Winsloe, Isaack Alderton, and Master John Carver — may be identified as contributors to the actions surrounding the creation of the Conference. Note, in passing, the almost invisible and unobtrusive application of honorifics for Standish and Carver. While the legal scenario was not identical, the names of the endorsers of the Mayflower Compact are important historical data and evidence of the transaction. Yet ever since 1622 and the first publication of the Compact text, the exclusion of the identities of the forty-one adult male signatories has been viewed more so as a significant savings in terms of both text space and text setting expense. Four decades later, the onset of the presentation of these names promptly led to issues of conformity. There exists today the question of how these appellations have been affected or modified by both time and printers. In addition, there persists the question of how these forty-one men actually wished to spell their names, let alone what deviations might have occurred since the seventeenth century. Thus, was the correct name actually William Winslow, or William Winsloe as conveyed by the Conference? These intra-language problems are often linked to the preference of the editor or printer, rather than to the exotic nature of foreign variants such as Chinggis/Genghis/Genghiz/Jengiz/Tchingis Khan or Moammar Ghadafi/Kaddafi/Khadafy/Quaddafi/Qadhdhāfī. There was an additional stimulus for a text analysis examination of the Compact and its signatories: token differences among renditions had been perceived and noted by earlier investigators. The fifth edition of Morton’s Memorial (1826a, pp. 37-38) contained notes that reported differences among referenced elements in Prince (1736, pp. 84-85) and in Mourt (Dexter, 1865/1969, p. 3); see line number 100, 122, and 137 of Table IV (Download Excel File), even if some of these conclusions were incorrect. Prince (1826, pp. 171-172) saw one text difference and identified several different spellings for five signatories. Dexter (1865/1969, pp. 6-7) counted nine text modifications evident in Morton (1669) and/or Bradford (1630), and the republication of Bradford’s History of Plymouth Plantation, 1620-1647 (1912/1968, vol. 1, p. 191) furnished five comments on adjustments made by Morton. The present study attempts to extend those examinations of such alterations, across far more renditions of the Compact. An effective tool is available that may aid in such determinations. In the mid-1960s, Vladimir Levenshtein proposed an algorithm to assess information transfer, where the three operations of deletion, insertion, and substitution may be engaged to correct errors contained in the reception of a transmitted string (Levenshtein, 1966). To display this procedure, Soukoreff and MacKenzie (2001) used the two string models quick brown fox and quixck brwn fox as exemplars of presented and transcribed texts in such a consideration. Overall, a half dozen individual errors may be present in this comparison — established by the failure of the xck br substring to accurately convey the initial ck bro material — but the two most likely faults consist of the insertion of the character x and the exclusion of the character o. With this algorithm, these data yielded a computed Levenshtein’s edit distance (LED) score of 2, or the sum of the number of corrective operations required to first remove the x from the xck constituent, and then to insert the o in the br fragment. Identical strings — say, quick brown fox and quick brown fox — would require no such correction and would thereby lead to a computed LED score of zero. Further, any observed LED score from these comparisons must be less than or equal to the maximum length of the two test strings, since replacing an entirely missing sequence with one of length n would require no more than n operations. Such a state exists when none of the transmitted material is received, as portrayed by the two strings quick brown fox and the blank phrase _____ _____ ___. The Levenshtein algorithm is very adaptable and has served in many diverse applications, including vehicle travel time measurement scenarios (Takahashi and Izumi, 2006); the development of ontologies (Ginsca and Iftene, 2010); the foundation of spell checking routines (Kukich, 1992); and for plagiarism software (Zini, Fabbri, Moneglia, and Panunzi, 2006). However, in text analyses as reported here, these LED scores are particularly intuitive, since any string comparison that supports an LED of zero means complete similarity between the elements in question, while any non-zero returned value immediately identifies the presence of disparities and the magnitude of such differences. The application of these LED calculations may be made at two levels. First, they may be computed at the token or element level. Two relevant examples are obvious in the test involving the terms dog and dig with its LED score of 1, and in the cumulative score of 14 that is generated in an evaluation of just the first lines of Walt Whitman’s 1855 original and of his later 1891 revision of I Sing the Body Electric, i.e., for an assessment that evaluates the variability between “The bodies of men and women engirth me and I engirth them “ and “The armies of those I love engirth me and I engirth them .” In this last scenario, the italicized words mark the four pairs of tokens that induce that LED score of 14 across these twelve elements. Ascertaining disparities between entire documents is a second opportunity with this tool. In theory, this approach might facilitate an inspection of various edition collections, or of a collation of statutes, or of similar ensembles. Observed changes in the computed cumulative LED amount found in text exemplars within such comparisons may then stimulate pertinent hypotheses regarding the provenance of those test materials. Direct quantification of differences — and then from the imposed endeavors to correct such dissimilarities — is therefore possible with Levenshtein’s metric. The comparison tool was constructed to take as input an Excel spreadsheet exported into a standard, non-proprietary, comma-separated-values (CSV) format that is easily readable by XSLT. This CSV file must employ the Unicode character set. Arrangement of the spreadsheet is critical, and assumes that the data consist of one column per text, with one row per word, and that these rows are aligned according to variances in the corpus texts. The columns must be ordered chronologically from oldest to newest. As a direct result of this asset organization, two families of Levenshtein calculations were composed. First, the Compact texts of pairs of forty variants, save for Prince3, Haxtun1, Haxtun2, Bowman, Mason, Banks, and Johnson, were compared. Second, the signatory lists of those thirty-four renditions with this content were assessed, i.e., thereby excluding Mourt, the five Bradford entries  , the six United States Congressional Serial Set documents (the three items in the Memorial series plus Landing, Association, and Status), and Carpenter. Finally, measurements of correlation were calculated between the Nerror and LED scores derived from the Levenshtein assessments of text and of names for those twenty-seven documents that possessed both components. The total number of comparisons for each of these scenarios may be calculated as N(N-1)/2 tests. For an examination of the forty Compact files without signatories, this would infer 780 contrasts; for the thirty-four name list-only materials, 561 comparisons; and for the correlations pertaining to text and endorsers, 351 pairs of Nerror and LED resulting values. For all variants, the test data were normalized to lower case and punctuation was removed. Note that each entry in the signatory ensemble consisted of at least a forename (or forename abbreviation — Wm Bradford or Edw Doten or Thos English or Rich Gardiner, for example) separated by a single space from a surname that on occasion was supplemented by an initial honorific (N = 136) or military rank designation (N = 8). The testing protocol required that the variants were rectangularized in order to align elements properly; pads were used to provide this spacing in both the text (i.e., Npad in Mourt = 14) and the signatory lists (total Npad = 3). This procedure increased the overall Compact text set to two hundred nine elements. See line number 11-12 in text Table IV (Download Excel File) as a demonstration of how such pads were created in response to spelling differences, and line number 1 of Human and line number 3 and 41 in Banks of signatory Table II (Download Excel File) for three inexplicable signatory absences. In the following discussions, the representative token for these additions will be denoted as [blank]. All five hundred sixty-one possible contrasts of the thirty-four signatory list renditions were tested with the Levenshtein algorithm, under the provision that Morton1 was considered as the first or “standard” rendition from which all following versions flowed. The line numbers in Table II (Download Excel File) are highlighted to reflect those thirty-one of forty-one name tokens (= 75.6%) that were found to be in error in at least one contrast. The “Name error counts” worksheet within Table II (Download Excel File) shows these tallies and the LED scores associated with each name. There are two sub-tables, one arranged by signatory name and the other in descending order of cumulative LED. Table III (Download Excel File) in turn enumerates the number of errors and the cumulative LED byte disparity for these calculations. In summary, 7,994 errors were found, generating a cumulative LED of 19,729 byes, or x̅ = 2.47 bytes/error. The residual ten unhighlighted bipartite terms in Table II (Download Excel File) — John Billington, James Chilton, Francis Eaton, John Goodman, John Howland, Thomas Rogers, George Soule, Thomas Tinker, John Turner, and Thomas Williams — were unaffected by spelling difficulties, forename abbreviations, and/or the incursion of an honorific or rank within this specific collection of materials. A few names were nearly as stable: John Alden appeared on the error list only because of his exclusion from the Human array; Thomas English was recorded as Thos. in the same publication; Edward Fuller was modified through the use of Edw. for his forename in Hutchinson; and Gilbert Winslow was absent because Banks barred this endorser. Further, there was an additional blank cell in the Banks column of Table II (Download Excel File), this time for John Allerton. This single Allerton data point therefore accumulated comparison errors because of its general absence, but also in part because of his designated honorific Mr. that was found in the five variants Poore, Thorpe, Commager1, Kavenagh, and Commager2. It is clear that the published arrangements of these forty-one signatory names have not been unswerving in these documents. Absent slight difficulties, Philbrick (2006, p. 43) was correct when he stated that such enumerations have commenced with passenger John Carver and terminated with servant Edward Leister, but the precise sequence of names in these instruments has varied across renditions. As one extreme exemplar, the single page Poore text has these names distributed in three text columns that, when compared to the style employed in Morton1, are similarly ordered only when the Poore names are read by commencing with the upper half of the first, then the second, and then the third columns, followed thereafter by the same sequence from left to right of the lower half of the three sets of identifiers. Only in this manner may the flow between the two terminal identities — here, Mr. John Carver and Edward Liester — correspond to the expected sequence. In order to expedite the comparisons within the endorser analysis task and to avoid such difficulties, the signatory names were alphabetized by surname and then by forename (the latter step was needed for the Allertons, Fullers, Tillys, and Winslows shown in the data for Morton1 of Table II (Download Excel File)). This procedure was not always successful since adaptations to Richard Bitteridge of Morton1 led to Richard Britterige in Prince1. This spelling adjustment led to an alphabetical misalignment. To show this outcome, the column titles of the twenty-five data arrays of Table II (Download Excel File) (= 73.5%) that express this token change — or, similarly, for the name Edmund Morgeson in Morton3 and Morton4 — are underlined and such adjusted appellations are bolded. Thus, the variants Prince1, Morton3, Morton4, Prince2, Thacher, Young1, Young2, Cheever, Prince3, Dexter, Goodwin, Provincetown, Arber, Haxtun1, Haxtun2, Whittemore, Thorpe, Bowman, Brown, Mason, Human, Banks, California, Kavenagh, and Johnson are so marked. Inspecting these data alone, it is clear that Morgeson was an error reserved solely to the pair of Morton3 and Morton4 variants; other differences associated with these names pivoted upon more subtle spelling errors. On the other hand and excluding the six Morton data sets, the transition to Britterige — correct or not — was almost universal after the publication in 1826 of Prince2. Note too that the handling of Arber even went to the extent of forcing the incursion of a bracketed r for its specific Richard B[r]itteridge element. The reversion to Bitteridge by Commager1 and Commager2 was due, as so declared, to the use of the Poore list from 1878. Further, the existence among these names of honorifics or military rank is not frivolous. These trimmings instantly partition the thirty-four renditions into two families: the labels for the columns of Table II (Download Excel File) and for the rows and columns of Table III (Download Excel File) are color coded to emphasize that division. Here, the green titles, such as for Prince1, flag data enhanced by these auxiliary personal titles; see line number 2 of Prince2 in Table II (Download Excel File) for Mr Isaac Allerton or line number 32 for Capt Miles Standish as two of the 144 such modified names. As always, those Levenshtein similarity tests that revealed no errors between two variants were of special interest. Out of 561 signatory examinations, just five pairs of data — Prince1-Prince2; Morton5-Morton6; Young1-Young2; Thorpe-Kavenagh; and Commager1-Commager2 — had no errors across endorser tokens; see Table III (Download Excel File). At the other end of the scale, six sets of renditions offered maximum Nerrors scores of 25 (i.e., involving 61% of all forty-one signatories) and each of these disparities was caused primarily from testing a non-honorific array against one containing such titles. Thus, California differed from Poore, Commager1, and Commager2, just as Hutchinson varied from Provincetown, Thorpe, and Kavenagh. These findings defined the upper limit of errors for signatories, but only about half of those errors were directly related to the presence of honorifics; other faults existed as well, including those caused by the abbreviated forenames in Hutchinson at line number 6-7 in Table II (Download Excel File) for the Wm Bradford and Wm Brewster entries in this version. As a preview of what may be seen in Table V (Download Excel File) for text contrasts, Levenshtein tests of the Young1-Young2 and the Commager1-Commager2 Compact contrasts repeated error-free, while Prince2 was also successful with Young1 and Young2. The maximum Nerrors score for text tests (= 95, or 45.5% of all tokens) occurred for the Bradford1 and Status pair, but all text testing with Status was confounded by the fact that its testimonium was excluded (see line number 166-209 of Table IV (Download Excel File)). Still, Bradford1 possessed many old spellings such as ye, vnderwriten, and soveraigne (at line number 2, 11, and 19) that prompted added faults. It is pertinent that while the signatory examination of Kavenagh produced a perfect result with Thorpe, the text of Kavenagh excluded a dozen elements that induced dissimilarities with other renditions of the Compact (see line number 81-93 of Table IV (Download Excel File)). Nevertheless, it is interesting to see that the percentage of signatory errors was 134% more (= 61% ÷ 45.5%) than that observed with text inquiries. This huge offset was due in large part to the added honorifics, even with the text exclusions exhibited by Status and Kavenagh. A query of Table II (Download Excel File) shows that this reliability fails beyond the Thacher account to degrade the consistency of Poore, Thorpe, Commager1, Kavenagh, and Commager2. Thacher used descriptions that can now be traced to Bradford’s writings and it was indicated in an earlier edition (1832, p. iv) that “Judge [John] Davis’s edition of Bradford’s memorial” was referenced. However, that publication also contained a footnote (Davis, 1826, p. 38) signaling that its Compact text and signatory list were instead taken directly from one of the first two Prince representations. Further, the signatory list appended directly to Davis’s Compact text had no honorifics whatsoever. Thacher must have used the contents of Davis’s footnote to create his list and in that process, the Mr. error must have been introduced by Thacher into the William Bradford entry since Davis did not assign that title to Bradford (p. 39). Thus, the attempt by Thacher, to bring to bear as much physical evidence as possible regarding the commitment of the passengers to this transaction, incorporated new extraneous data that were only marginally related to the Compact signing itself. Thorpe announced that he also had consulted Bradford’s work, but his text was very close to that created by Poore; and Commager and Kavenagh each acknowledged that Poore was employed. Therefore, the incursion of Mr. into the William Bradford record in the signatory list of at least the Thorpe, Commager1, Kavenagh, and Commager2 versions must have originated in Poore. Nevertheless, the Compact text analyses findings in Table V (Download Excel File) provided evidence that the Nerrors and cumulative LED scores for text comparisons of Thacher, Young1, Young2, and Provincetown were at a minimum when compared to Prince2. The conclusion must be that Prince introduced those honorific shortfalls to subsequent accounts through his inclusion of Bradford’s manifest list. In other words, a form of Bradford’s passenger roster later took the place of the signatory list that Morton had only first produced in 1669 (i.e., in Morton1; Morton, 1669, pp. 15-16); Bradford had no such enumeration appended to his Compact text (see Bradford, 1912/1968, vol. 1, pp. 191-192). As already observed, Prince openly specified this — “… but their names corrected, with their titles and families I take from the list at the end of Governor Bradford’s folio manuscript” (Prince, 1736, p. 85; emphasis added) — even if later transcriptions that employed Prince’s material may have forgotten to mention this linkage between the Compact text and Bradford’s appendix. Given this general scenario, the apparent subsequent penalty for historical research was that thirteen future Compact versions exhibiting honorifics were composed from its standard text and a passenger list, instead of upon those words and the Morton signatory list first provided within his 1669 rendition. The possibility that Morton may have simply copied the relevant male names from Bradford’s appendix is not supported by the observation that the order of those appellations is arranged in a different manner in Bradford’s appendix compilation than it is in Morton’s Compact roster. Absent the noise of the honorifics included by Bradford, he designated John Carver, William Brewster, Edward Winslow, and William Bradford as the first four entries in his passenger list, whereas Morton presented John Carver, William Bradford, Edward Winslow, and William Brewster in his ensemble. Thus, it would seem that Prince, who allegedly had access to the original but subsequently lost Compact, employed that document’s signatory order and/or the one produced by Morton (who definitely had seen the instrument) but then modified — and thereby introduced more faults into — the outcome by consulting Bradford’s History for pertinent “titles and families” data. It is also immediately evident from Table II (Download Excel File) that the Richard Britterige error was initiated in a similar way through Prince1 and that the name was taken directly from Bradford’s collection (Bradford, 1912/1968, vol. 2, p. 400). Later on, in 1897 and without the honorific subset of variants, Arber made adjustments to the Bitteridge name that were manifest in the Morton1 and Morton2 variants ahead of the publication of Prince1. To solve the confounding circumstances for this name, Arber included an [r] and a d to conform to both Prince’s (1897, p. 379) and Morton’s spellings (1669, p. 16), even after declaring that “Nathanial Morton, who had evidently see the original document, gives the names of the Signers at pp. 15, 16, of his New England Memorial, 1669, 4, in the following order…” (p. 378), i.e., it was self-declared that Arber took the names from Morton1 for his study. In brief, Arber made an effort to have it both ways within his rendition of the Compact. The Capt. honorific assigned to Miles Standish began in Prince1 and the other seven occurrences of this label emerged in Prince2, Thacher, Young1, Young2, Cheever, Prince3, and Provincetown; see line number 32 in Table II (Download Excel File). All of these presentations were members of the Prince1 “honorifics” clan of texts, even if the five other versions in that group (i.e., Poore, Thorpe, Commager1, Kavenagh, and Commager2) applied the expected Mr. title but failed to sustain the military rank designation assigned to Standish. Indeed, the use of Mr. itself became variable over time — Thacher, Poore, Thorpe, Commager1, Kavenagh, and Commager2 all had eleven instead of ten names with this enhancement, but not consistently so. Poore, Thorpe, Commager1, Kavenagh, and Commager2, in another manifestation of their commonality, employed an unmodified Isaac Allerton, but added Mr. John Allerton. Thacher, plus these last five presentations, literally went against the alleged wishes of William Bradford himself (Prince, 1736, p. 85) by including a Mr. honorific to his name. In addition, there is every reason to believe that the Prince3 name list was lifted directly from one of the two earlier Prince productions that had included both the Compact subscribers and their honorifics. If one now relies exclusively upon a footnote in Morton6 — from which this Prince3 list was taken for this investigation — then those names were reproduced from the Prince2 example. In that notation, Morton6 announced that “[t]he following corrected list is from Prince’s Annals, p. 172” (Morton, 1855, p. 26; emphasis added). This citation directly implicates the use of the 1826, and not the 1736, edition of Prince’s work. In fact, it appears that either of the 1736 or the 1826 effort could have been used to supply this roster because Table III (Download Excel File) shows that there were no observed errors in the Prince1-Prince2 signatory Levenshtein evaluation. Later, difficulties arose in the Prince2-Prince3 test when Edward Leister became Edward Leicester and the Tilly brothers had their surname adjusted to Tilley (see line number 24, 33, and 34 in Table II (Download Excel File)). What is critical here is not that these specific textual adjustments were introduced over time into the signatory lists, but rather that they persevered after they were planted there, owing most likely to the reliability of those who created a subsequent variant from an earlier model. The simple presence or absence of these few disparities speaks volumes to the basis of their documents’ underlying provenance, which the quantification of errors, in studies such as this, is designed to help expedite. The remaining twenty-one offerings without honorifics must be derivations of Morton1 that, in 1669, began the tradition of the inclusion of these names. This group would be composed of Morton1, Morton2, Hutchinson, Morton3, Morton4, Morton5, Brigham, Morton6, Dexter, Goodwin, Arber, Haxtun1, Haxtun2, Whittemore, Bowman, Brown, Mason, Human, Banks, California, and Johnson. Note, however, that in six cases this hypothesis is based solely upon the characteristics of signatory lists: none of Haxtun1, Haxtun2, Bowman, Mason, Banks, or Johnson variants had any accompanying Compact text to substantiate a check for similarity. In a different publishing approach taken in 1920, Bowman reproduced images of the 1669 Morton1 pages that contained both the body and the signers list of the Compact. In this single action, Bowman reproduced without intervention all the relevant text and names, and simultaneously declared his source. Seven hundred eighty Levenshtein evaluations were made from pairs of the forty variants’ text contents. Of the two hundred nine Compact tokens, one hundred twenty-nine or 61.7% were found to be disparate in at least one test. These individual elements have their line numbers highlighted in Table IV (Download Excel File); as one such difference, see the tokens the and ye at line number 2 of Mourt and Bradford1, respectively. A total of 30,841 errors were found, generating a cumulative LED of 77,052 bytes, or x̅= 2.50 bytes/error, a rate very similar to the 2.47 bytes/error mean found for the signatory names examination. In isolation, the Mourt-Bradford1 contrast, though, offers much more. The terms vnderwritten, iames, vnder-taken, selues, iust, vnto, haue, and here-vnder in Mourt (line number 11, 22, 41, 98, 128, 157, 170, and 171 in Table IV (Download Excel File), respectively) illustrate a contemporary shift in English orthography and typesetting. The Oxford English Dictionary exhibits comments on the transitions of v to u (1989, vol. XIX, p. 380, and vol. XVIII, p. 800), and from i to j “after 1600” (vol. VII, p. 588, and vol. VIII, p. 159). Subsequent to Bradford1 in 1630, most of these orthographic issues disappeared, except in clear instances where there was a desire to reproduce accurately previous documents. Dexter (1865/1969), for example, successfully replicated Mourt’s Relation or Journal of the Plantation at Plymouth; no observed errors in Table V (Download Excel File) for the Mourt-Dexter contrast thereby set the minimum for the Mourt series of Levenshtein tests. An earlier similar exemplar, Cheever, incorporated vnderwritten, vnder-taken, vnto, and here-vnder into its text and exhibited, relative to Mourt, only a small error count (Nerror = 6; see line number 97, 98, 104, 179, 184, and 187 of Table IV (Download Excel File)), and a miniscule cumulative LED of 17 of which twelve bytes were due to the comparison of our selues vs. ourselves at line number 97-98. The title page of this account claimed that the contents were “reprinted from the original volume,” and these Levenshtein results offer strong evidence to substantiate that declaration. Dexter’s perfect match with Mourt meant that the Cheever-Dexter contrast exposed the same six errors; see Table V (Download Excel File). Table IV (Download Excel File) suggests immediate and distinct provenance data through simple inspection: the three Mourt tokens yeare of the from line number 184-186 were absent in the dozen variants Morton1 through Morton6, Brigham, Poore, Thorpe, Commager1, Kavenagh, and Commager2. The complete block of Morton editions reinforced the notion that successive printings of this series occurred through the replication of one of its earlier members — the successive low Nerror scores in Table V (Download Excel File), relative to Morton1, show just 4 to 12 discrepancies within the complete two hundred nine token array (= 2 to 6%). Brigham was clearly the source for Poore, given the evidence that just into was presented later as unto, and dom was followed by domini (line number 157 and 208 in Table IV (Download Excel File)). The dom notation was very much a Morton series manifestation; Morton6 maintained this token two decades after Brigham was created. Low Nerror counts for Poore, Thorpe, and the two Commager texts also advocated for a common ancestor instrument. The Kavenagh-only exclusion at line number 81-93 of Table IV (Download Excel File) (Morton1 had solemnly and mutually in the presence of god and [blank] one [blank] another) amplified its Nerror score of 25 in the contrast between these two Compact variants, so the later shared (yet smaller) exclusion of yeare of the phrase at line number 184-186 was particularly useful for linking these two texts. The fact that the Poore, Thorpe, Commager1, Kavenagh, and Commager2 documents contained honorifics suggested that Poore must have been composed as an adjustment to a Morton version and that this new description was, in turn, used in the ensuing four publications. The advantage gained from examining this suite is that Poore experienced an honorific incursion: it added the title Mr. to William Bradford’s name (see the Poore entry on line number 6 in Table II (Download Excel File)) that other authors had previously noted was purposely excluded from his History by Bradford himself. This mistake may now be traced back to the Bradford entry in Thatcher. In summary, Poore’s unreferenced “Agreement between the Settlers at New Plymouth” (1878a, p. 931) was most likely formed from the Morton6 Compact text published two decades earlier in 1855 to which was appended the flawed signatory list from Thacher’s even earlier History of the Town of Plymouth (1835, p. 18). Thorpe, Commager1, Kavenagh, and Commager2 then systematically continued to present that combined Poore source through their own reproductions. Thorpe even employed the same document title as Poore, but added a confusing footnote (1909, p. 1841) purporting that the material — including the Bradford honorific error — was taken directly from “William Bradford’s Plimouth Plantation.” This note was apparently incorrect since an examination of the opening statement of the Compact in Plimouth (1901, p. 110) uncovered the statement “In ye name of God, amen.” Thorpe’s alleged reproduction of Plimouth declared instead the phrase “In the name of God, amen” (1909, p. 1841). To complete the attribution circle for these versions, Commager declared Poore as his source (1935, p. 15 and 1988, p. 15), while Kavenagh cited Thorpe (1973, p. 246). Further evidence exists that a fixation upon faithful text reproduction may sometimes be derailed. Davis (1908, p. 107), who used the adage “In the name of God, amen,” even though he had presented on the previous page a facsimile of Bradford’s manuscript that displayed “In ye name of God, amen,” successfully included the correct William Bradford token without the honorific (p. 407). Figure 1. Cape Cod, Massachusetts, Spring 1997 (Image NM23-744-633, courtesy of the Image Science and Analysis Laboratory at the National Aeronautics and Space Administration’s Johnson Space Center). The multiple editions of Bradford (N = 5); Morton (N = 6); Prince (N = 2; Prince3 is only a list of signatories); Young (N = 2); and Commager (N = 2), plus the five documents from the U.S. Congressional Serial Set — Memorial1, Memorial2, Landing, Association, and Memorial3 — permitted strong assessment of highly correlated materials. The very low signatory Nerror scores for the tests of Morton1 against Morton2 through Morton6 — i.e., the Nerror values of 3, 4, 3, 4, and 4 (= 7.3 to 9.8%) available in Table III (Download Excel File) — were replicated when their Compact texts were considered. The observed Nerror calculations for these tokens in Table V (Download Excel File) are 4, 10, 10, 8, and 12, respectively (= 1.9 to 5.7%). This reliability may serve as a critical signal within text analysis and this may be seen quickly by examining the Bradford series. Table V (Download Excel File) illustrates low text Nerror scores for contrasts between Bradford1 and Bradford2 (N = 10) and Bradford3 (N = 11), but ensuing tests showed wide disparities: Bradford1 vs. Bradford4 or Bradford5 had 35 and 38 errors, respectively, or a three-fold increase. Many of these new errors were induced by an editorial decision to change the 16 ye tokens to the in Bradford4 (see line number 2, 24, 37, 43, 51, 67, 71, 85, 114, 151, 155, 178, 183, 186, 199, and 204 in Table IV (Download Excel File)). The latter alterations were replicated in Bradford5, as validated by the small Nerror count for the Bradford4-Bradford5 test (N = 3; the faults were haveing vs. having; such vs. shuch; and ano vs. anno at line number 40, 127, and 207 in Table IV (Download Excel File)). Thus, two document streams may be detected for the six Bradford instruments. Parallel conclusions may be derived from the inspection of the Nerrors values for the Serial Set documents. The texts of Memorial1, Memorial2, Landing, and Association were very similar, although Memorial3 diverged far more than the others did. Four errors were due to Memorial3’s transition from ye to the; from aforesaid to a foresaid; and to to do in line number 71, 116-117, and 122 of Table IV (Download Excel File), but these Nerror values, though small, were still large enough to gain notice. Thus, as exhibited here, Levenshtein processing can be a fruitful tool, even when comparisons are made among variants that are nearly identical. There remains the commonality of the cap-codd token at line number 176 of Table IV (Download Excel File) to bolster this suite of federal documents. For the remaining pairs, Young1 and Young2 were indistinguishable, as were Commager1 and Commager2. If there were any lingering doubts that each of the later editions of these two publications emerged directly through the replication of its initial imprint, their results in Table V (Download Excel File) convey evidence that the printers were successful and accomplished their task with precision. As noted above, the maximum Nerrors score for text tests — 95 faults, or 45.5% of all elements — was seen in the Bradford1-Status test. Table IV (Download Excel File) discloses that all text testing with Status was confounded by the exclusion of its entire forty-four word testimonium (see line number 166-209), and that Bradford1 alone exhibited many older spellings such as ye, vnderwriten, and soveraigne (line number 2, 11, and 19) that exacerbated those difficulties. In fact, Status was involved in a half dozen other scenarios where the Nerrors score was 90 or greater. These orthographic issues observed in Bradford1 perseverated in Bradford2 and Bradford3 (each had 91 Nerrors). The U.S. Congressional Serial Set entries of Memorial1, Memorial2, Landing, and Association had 91, 90, 90, and 90 differences with Status, respectively, but these documents also contained many old tokens like lloyal, advancemente, and cap-codd (see line number 14, 49, and 176). This abundance of observations — that collectively substantiates that there are copious errors between pairs of Compact text variants, as well as between sets of their corresponding signatory lists — offers an intriguing scenario. In general terms, is it possible to predict increased dissimilarity within a number of paired Compact text comparisons by simply noticing a parallel degree of divergence in their shorter signatory lists? The ability to limit analysis time through the inspection of only a subset of a document’s data would be efficacious. In this examination, the ratio of the total number of document elements to name tokens was roughly 2:1 — in Young1, for example, there are about 200 tokens allocated to the Compact and about 90 combined forename, surname, and honorific or military rank items in its endorsers’ list. Other official declarations — such as King Charles II’s Royal Charter Incorporating the Hudson’s Bay Company, A. D. 1670 (see Rich, 1942, pp. 131-148; henceforth Hudson’s) — have more substantial multiples. The text of Hudson’s is much longer, at approximately 6,600 words, and it too is an excellent vehicle to confirm contemporary spellings of the seventeenth century. The Compact tokens doe, vertue, and lawes, as well as the phrase meete and convenient (line number 77, 120, 131, and 147-149 of Table IV (Download Excel File)) were preserved in diplomatic language and found half a century later in Hudson’s (Rich, 1942, p. 132, 142, 140, and 143, respectively). Further, the -eing ending exhibited by haveing in the Compact (line number 40 in Table IV (Download Excel File)) surfaced in Hudson’s through the tokens undertakeing, handleing, takeing, tradeing, and executeing (p. 131, 134, 137, 138, and 148). With regard to named individuals, Hudson’s preamble confirmed the identities of the eighteen “adventurers” (Rich, 1942, p. xix) to whom the King granted permission to continue their explorations “for the discovery of a new Passage into the South Sea and for the finding some Trade for Furrs, Mineralls, and other considerable Commodityes” (p. 131). These dozen and a half men were acknowledged, in the simplest manner, as Prince Rupert; Christopher, Duke of Albemarle; William, Earle of Craven; Henry, Lord Arlington; Anthony, Lord Ashley; Sir John Robinson; Sir Robert Vyner; Sir Peter Colliton; Sir Edward Hungerford; Sir Paul Neile; Sir John Griffith; Sir Phillipp Carteret; James Hayes; John Kirke; Francis Millington; William Prettyman; John Fenn; and John Portman. What is significant in Hudson’s is that all these names appear in a later, second article (p. 132), and then a portion of them — Prince Rupert; Sir John Robinson; Sir Robert Vyner; Sir Peter Colleton; James Hayes; John Kirke; Francis Millington; and John Portman — are used a third time to define the Company’s initial Governor and Committee members (p. 134). Internally, Hudson’s displays spelling discrepancies: the name for Sir Peter Colliton reappeared as Sir Peter Colleton in that second article, and Sir Phillipp Carteret resurfaced as Sir Phillipp Carterett . Sir Peter Colleton was then reapplied in the Committee assignment section. Yet, these fore- and surnames appeared to be far less variable than the elements in such inventories as Seas Streightes Bayes Rivers Lakes Creekes and Soundes (p. 132) or Grantes Libertyes Priviledges Jurisdiccions and Immunityes (p. 134) that were employed in this specific charter. If these more stable personal tokens may be used successfully as an index of the actual degree of successful replication of a text, as suggested above, then exploring such long documents as Hudson’s might be expedited by studying just a relatively few items within it. In the end, and regardless of the actual steadfastness of surnames over the decades of reproduction, the possibility of demonstrating a correlation between the error scores obtained through Levenshtein calculations of a pair of complete documents composed of both a text portion and a names section would be quite fruitful. This would be especially so if the smaller sublist actually behaved as an accurate forecaster of the variability of the larger section. Moreover, this unpredictability might be constrained: even if the names arrays became less steady over time, these tokens might still degrade only to the extent found among their text element cousins; i.e., the appellations might simply be affected to the same degree as other tokens in the rest of the entire variant. Under either circumstance, such a comparative quantitative approach would illuminate the presence of a relationship between these two — or, potentially for more extensive materials, more numerous — portions. Indeed, the failure to show a strong linkage between the correctness of these separate pieces of an individual document would suggest that they were processed at different times and/or by different printers. Such correlation statistics were computed for the twenty-seven Compact files, identified in Table I by the “Both” materials column, that possessed the two classes of text and name data. Three hundred fifty-one pairs of text error counts and cumulative edit distance values, and a corresponding ensemble for their signatory data, were gathered from the Levenshtein calculations contained in Table III (Download Excel File) and V (Download Excel File) and placed in Table VI (Download Excel File), which was then ordered by the variant test pair names found in the orange column. As an example taken from the first line of this new Table, the Levenshtein results for the Arber-Brown contrast were found to be 58 errors and 141 LED bytes for the Compact text analysis alone, and 4 errors at an expense of 7 bytes for the signatory list consideration only; see this pair of red and the blue columns in Table VI (Download Excel File), respectively. The new, formed data pairs — here, 58 and 4 errors, and 141 and 7 bytes — became the first of 351 entries in the data array for computing correlations between the text and the signatory examinations’ outcome scores of Nerror and of byte disparity. For this subset of variants, a total of 8,888 errors generating a cumulative LED of 23,422 byes (x̅ = 2.64 bytes/error), and 5,010 discrepancies costing 12,446 bytes (or x̅ = 2.48 bytes/error) were found for the text and the signatory series of tests, respectively. These totals are provided in line number 353 of Table VI (Download Excel File). In this correlation scenario, the null hypothesis was considered as r = 0, i.e., that there was no correlation between these pairs of text and signatory data on either the number of errors or the cumulative LED dimension (Cohen, 2001, pp. 256-260 and 695). Table VI (Download Excel File), as noted, collects these observations, where the orange column lists the 351 pairs of variants under consideration; the red columns contain the Levenshtein text results; and the blue columns encompass the outcomes for the original signatory data attached to those pairs. The results yielded correlation r = 0.169 for those pairs of text and signatory Nerrors observations, and r = 0.095 for their cumulative LED amounts; see the blue summary box at line number 355-356. The first calculation for the Nerrors was significantly different from the null hypothesis (t = 3.197, 349 df, p < 0.01, two-tailed), but the second one for the cumulative LED test was not (t = 1.792, 349 df, n. s.). The significant outcome supports the proposal that evaluating a specific Compact variant’s signatory list may provide a meaningful prediction of the quality of the accompanying Compact text, in terms of the total number of observed errors. Thus, such an application — i.e., of the observed error count of a relatively shorter subset of a document to estimate the number of errors in a larger portion of the same material — may be possible with other publications. Nevertheless, these correlations were diminished to some extent by the presence of the honorifics in only a subclass of all those variants. In order to adjust for this noise in the data, the signatory values from Table II (Download Excel File) were reexamined after removing the 136 Mr and 8 Capt honorifics. The revised Nerror and LED findings fill the green column of Table VI (Download Excel File). For those 221 tests (= 63%) that were affected by this maneuver, their variants’ identifier was highlighted in the orange column. Thus, by comparing the blue and the green column values, the Nerrors and cumulative LED for the Arber-Commager1 contrast was reduced from 23 and 53, respectively, to 12 and 20 after the removal of honorifics. The Arber-Brown scores, on the other hand, were unaffected since neither file was modified during this reexamination. Note that this Arber-Commager1 outcome conforms to the expectation discussed earlier: the variants Thacher, Poore, Thorpe, Commager1, Kavenagh, and Commager2 all had eleven Mr honorifics instead of ten, and the latter five variants did not contain the Capt one. Further, the title deletions included a required blank in advance of the forename — in other words, the completely removed token was Mr_ or Capt_ — and so the total byte reduction was expected to be 11 x 3 or 33 bytes, as was returned for that test in the reduction of the cumulative LED from 53 to 20 in the Arber-Commager1 test. The new correlation results with these modified data yielded an r = 0.262 for those pairs of text and adjusted signatory Nerrors observations, and r = 0.219 for their cumulative LED amounts (see the green summary box on line number 358-359). Both results were significantly different from the null hypothesis (t = 5.072 and 4.193, respectively; 349 df, p < 0.0001, two-tailed) and thereby corroborated the contention that the Nerrors of the signatory data are correlated to the Nerrors scores of the main text of the Compact. The cost of gaining a better correlation between the observed Nerrors of the text and the now honorific-deleted signatory data, however, was that the latter title information actually provided useful provenance evidence for the thirteen Prince1, Prince2, Thacher, Young1, Young2, Cheever, Prince3, Poore, Provincetown, Thorpe, Commager1, Kavenagh, and Commager2 alternatives. Therefore, these observations suggest that there are at least two possible tasks, during such text analyses, which may not be independent: the determination of provenance, and the resolution of a simple but reliable way to estimate expected error rates in large documents. Here, striping the data that conveyed the means to derive a robust route to their past was the expense incurred for achieving a meaningful tool for estimating parallel error rates. In this scenario, the Compact honorifics were a prominent difference to focus upon; other materials may possess less pronounced characteristics. Finally, one distinct advantage of examining the Compact, or potentially some other similar document, pivots directly upon the accuracy of the employed lexicons. Here, an important announcement was created when the Compact was written. Accuracy was important, but this was secured to a certain degree by employing community leaders to make this statement. Later, professional printers — who earned their livings by reliably replicating previous publications — had a limited amount of editorial opportunities, let alone the need, to modify such critical texts. However, the names of these instrument participants — whether the attached signatories from the Compact, the adventurers’ list from Hudson’s, or from virtually any other manuscript that incorporates surnames — appear to be less exposed to variation than the day-to-day instrument lexicon. This would mean then that even though letters (vs vs. us) or even tokens (haveing vs. having) might fluctuate over time, surnames might possess a bit more endurance. Thus, a consideration of these formal tags may serve as a firmer estimate of accuracy for comparisons between entire variants that possess such identifiers. The corollary to this strategy is that the rigor of these appellations may make more blind their reuse or reappearance, thereby inducing an ongoing error that may be even more fixed for names than for text elements that may be subsequently perused for possible adjustment to more contemporary standards. The Compact provided evidence of this: all those Richard Britterige changes originated in Prince1 (along with the other honorifics issues) and were thus faithfully carried forward in another dozen name lists, save for Poore, and then the subsequent offspring variants of Commager1 and Commager2. On the other hand, there seems to be little doubt that a token like haveing would become having over time, if it had been present in the Compact as it was in Hudson’s. The Levenshtein algorithm, as deployed in these Compact evaluations, was designed almost a half century ago to investigate the similarity of two streams of data. Previous applications of this procedure have included an inquiry into the Treaty of Fort Laramie with Sioux, etc., 1851 (Bernholz and Pytlik Zillig, 2010 and 2011), the 1870 Okmulgee Constitution that was published through official and popular means (Bernholz, 2012a), and the forced convergence of two official versions of the Okmulgee Constitution , i.e., the original from 1870 and a revised variant created in 1875 (Bernholz, 2012b); a consideration of faults found in ensuing editions of a single reference source of the Royal Proclamation of 1763 (Bernholz and O’Grady, 2012a); reflections upon the variability of tribe rosters from the 1764 Plan for the future management of Indian affairs (Bernholz and O’Grady, 2012b); and an assessment of the founding transaction in New Zealand between the British and the Maori (Bernholz, O’Grady, and Pytlik Zillig, 2012). The discrepancies observed with this tool helped to facilitate the consideration of the provenances of these materials. While dissecting any of these noteworthy instruments was a productive means to expose their derivation and the evolving orthographic, typesetting, and printing activities of the eighteenth and nineteenth centuries, appraising a potential correlation between two general portions of, say, text and signatures in a single seventeenth century manuscript was the next appropriate step. The numerous distributed variants of the Compact not only fostered respect for its intrinsic value within the published universe of the history of the United States, but they also provided a broad pool of tokens to explore with this method, and to help comprehend provenance and error creation among these documents over several centuries. Moreover, part of this process furnished a reminder that the Levenshtein procedure was designed specifically to unearth and assess inaccuracies between renditions. These blunders infest all printed materials, including such unique resources as those reporting the life of Joan of Arc in which the range of deficiencies was denoted as “typical transcription errors,” “forgeries,” and even “utter inventions” (Bouzy, 1996, p. 75), or in which “the abjuration included in the trial manuscripts does not appear to have been the same as the one Joan signed” (Sullivan, 1999, p. 137, n. 6), or in which the presence of “[s]ome texts, incomplete and wrongly interpreted, have favored a historical reconstruction of these events that compare badly with earlier versions” (Fraikin, 1996, p. 68). More mundane texts have suffered from the same shortfalls. Variants of the Compact are no different, but — ultimately — the original document is no longer available to speak on its own behalf and the world of text analysis demands caution in such situations. Thus, one of the hidden fundamental facets of any such endeavor is the issue of whether the document under examination is intact and serves as a true reflection of the event. The presence in Conference of six — or, perhaps, seven — articles would be an appropriate though modest model for such an inquiry, because there always remains a secondary interest under such circumstances: who created that seventh provision with this accord status? Bradford’s History (1912/1968, vol. 2, pp. 201-202) did not replicate that additional declaration but, as noted earlier, the inclusion or the exclusion in Mourt and Bradford’s work of several of these matters was recounted in a footnote within that volume (p. 201). With only a slight twist, the same conundrum may be considered for the Compact, since the initial Mourt rendition did not append the signatories to its version. The desire to add those names later made sense from an historical perspective, and traditional images of the event portray a group of men — and not women — signing something. The revelation by Prince that the work of Morton and Bradford informed his presentation of the Compact, accompanied by its endorsers’ names (1736, p. 85 and 1826, p. 172), was carried forward by Young, who announced that he had “inserted this list from Prince, who found it at the end of Gov. Bradford’s MS” (1841, p. 122 and 1844, p. 122). Cheever simply reiterated Prince’s conduct (1848, p. 27). Editorial remarks found in Bradford3 considered the course taken to first locate and then to attach this inventory to the text of the Compact: “Bradford gives no list here of the signers of this compact. Morton must have had some other authority than this History for the names he has appended to it in the Memorial, or else he supplied them by conjecture from Bradford’s list of passengers in the Appendix. If we suppose this compact to have been signed by all the adult male passengers, it would seem that other names besides those Morton has given should have been included” (1856, p. 90; emphasis added). Dexter, while revisiting the Mourt publication, selected Morton, Prince, and Bradford for his group of preceding list adjusters (1865/1969, p. 3/7). Goodwin (1888, p. 64) succinctly observed that “Bradford gives no list of names; this is adapted from Morton.” Arber (1897, p. 378) led readers to a passengers list, while Brown, after decrying the loss of the original Compact document itself, delivered a “list of signatures” but did not cite his source (1920/1970, p. 194; emphasis added). It would appear, then, that the foundation of these efforts has been a less than secure one, and the use of conjecture as a possible explanation for the resulting signatory array does not bode well for implementing text analyses that expect some formal basis for contents. These few clarifications, pertinent to the construction of known Compact variants, are not disclosed to confound — or, with regard to the application of the term conjecture, to inhibit — the progress that may be achieved through careful study of these materials. Rather, these reflections are meant to communicate a glimpse of the fundamental seed of difficulties that many text analyses must face: here, we will never know what the original Compact said or contained, other than through these manipulations that have occurred during the last four centuries. From one perspective, the traditional flow of signatories — beginning with John Carver and terminating with Edward Leister — has been precariously based upon the general assumption that all the participants were accurately enumerated by the roster’s initial compiler, and that they actually appeared in this sequence at the close of the original Compact. In part, the known social status of these two specific men might support the contention that theirs were indeed the endpoints for such a name order (Johnson, 2006, pp. 104-114 and 180-181), but there are no assurances whatsoever that any signatory account is accurate and, unfortunately, the same unease envelops the text portion of this important instrument. Nevertheless, it appears from this study that the veracity of the incorporated signatory names in Compact variants may be used as an effective indicator of the soundness of their corresponding text reproductions. The capacity to herald overall replication success thereby imparts a substantial power to these few names. Yet, any unveiling of these very faults — regardless of their individual origin, magnitude, or era — advances future inquiries far beyond the sheer recognition of inconsistencies, even if difficulty pervades attempts to comprehend an underlying rationale for purposeful modifications within some texts, such as those confounding the Johannic ones. This proactive attitude will be especially rewarded if robust correlations between modules of single manuscripts — as shown here through queries directed at the Mayflower Compact text and signatory elements — may be found. Accordingly, it is the almost inevitable shared tendency to create unpremeditated errors within a family of renditions, not the propensity to generate an endless flow of identical communal tokens, which can spur progress in undertakings designed to fathom the valid features of an individual text through simple quantitative appraisals of its component subsets. Adams, J. Q. (1802). An Oration Delivered at Plymouth, December 22, 1802. At the Anniversary Commemoration of the First Landing of Our Ancestors, at that Place. Boston, MA: Printed by Russell and Cutler. Ames, A. (1907). The May-Flower and Her Log: July 15, 1620-May 6, 1621, Chiefly from Original Sources. Boston, MA: Houghton, Mifflin, and Co.
Arber, E. (1897). The Story of the Pilgrim Fathers, 1606-1623 A. D.; As Told by Themselves, Their Friends, and Their Enemies. London: Ward and Downey. Aust, A. (2007). Modern Treaty Law and Practice, Second Edition. New York: Cambridge University Press. Banks, C. E. (1929/1962). The English Ancestry and Homes of the Pilgrim Fathers Who Came to Plymouth on the “Mayflower” in 1620, the “Fortune” in 1621, and the “Anne” and the “Little James” in 1623. Baltimore, MD: Genealogical Publishing. Bernholz, C. D. (2012a). An analysis of the variants of the Okmulgee Constitution. The Chronicles of Oklahoma 89, 496-498. Bernholz, C. D. (2012b). The quantification of a forced convergence of similar texts: The 1870 and the 1875 Okmulgee Constitution and Levenshtein’s edit distance metric, and accessed here on 25 November 2012. Bernholz, C. D. and O’Grady, B. T. (2012a). Insights from editions of The Annual Register regarding later variants of the Royal Proclamation of 1763: An application of Levenshtein’s edit distance metric, and accessed here on 25 November 2012. Bernholz, C. D. and O’Grady, B. T. (2012b). The Indians of the northern and southern districts of North America: Levenshtein comparisons of the tribe lists from the 1764 “Plan for the future management of Indian affairs,” and accessed here on 25 November 2012. Bernholz, C. D. and Pytlik Zillig, B. L. (2010). In the most friendly & conciliatory manner: A proposed final version of the Treaty of Fort Laramie with Sioux, etc., 1851, and accessed here on 25 November 2012. Bernholz, C. D. and Pytlik Zillig, B. L. (2011). Comparing nearly identical treaty texts: A note on the Treaty of Fort Laramie with Sioux, etc., 1851 and Levenshtein’s edit distance metric. Literary and Linguistic Computing 26, 5-16. Bernholz, C. D.; O’Grady, B. T.; and Pytlik Zillig, B. L. (2012). The Treaty of Waitangi, 1840: A Levenshtein edit distance analysis of English language variants, and accessed here on 25 November 2012. Bouzy, O. (1996). Transcription errors in texts of Joan of Arc’s history. In B. Wheeler and C. T. Wood (Eds.). Fresh Verdicts on Joan of Arc (pp. 73-83). New York: Garland Publishing. Bowman, G. E. (1920). The Mayflower Compact and Its Signers: With Facsimiles and a List of the Mayflower Passengers. Boston, MA: Massachusetts Society of Mayflower Descendants. Bradford, W. (1630). Bradford manuscript. In the possession of the State Library of Massachusetts. Bradford, W. (1856). History of Plymouth Plantation. Boston, MA: Massachusetts Historical Society. Bradford, W. (1912/1968). History of Plymouth Plantation, 1620-1647, 2 vols. New York: Russell & Russell. Bradford, W.; Morton, G.; Winslow, E.; and Cushman, R. (1622). A Relation or Iournall of the Beginning and Proceedings of the English Plantation Setled at Plimoth in New England, by Certaine English Aduenturers both Merchants and others With their Difficult Passage, their Safe Ariuall, their Ioyfull Building of, and Comfortable Planting Themselues in thfe now well Defended Towne of New Plimoth. As also a Relation of Foure Seuerall Discoueries since made by some of the same English Planters there Resident. London: Printed for Iohn Bellamie. Bradford’s History “Of Plimoth Plantation.” From the Original Manuscript. With a report of the Proceedings Incident to the Return of the Manuscript to Massachusetts. (1901). Boston, MA: Wright & Potter Printing. Brigham, W. (1836). The Compact with the Charter and Laws of the Colony of Plymouth: Together with the Charter of the Council of Plymouth, and an Appendix, Containing the Articles of Confederation of the United Colonies of New England, and Other Valuable Documents. Boston, MA: Dutton and Wentworth. Brown, J. (1920/1970). The Pilgrim Fathers of New England and Their Puritan Successors (Fourth Edition). New York: Kraus Reprint. Buckingham, J. S. (1841). America, Historical, Statistic, and Descriptive, volume III. London: Fisher, Son, and Co.
Buechel, E. and Manhart, P. (2002). Lakota Dictionary: Lakota-English/English-Lakota: New Comprehensive Edition. Lincoln, NE: University of Nebraska Press. Cape Cod Pilgrims Memorial Association. (1906). Senate. 59th Congress, 1st session. Senate Report No. 1210 (Serial Set 4904). Washington, DC: Government Printing Office. Carpenter, E. J. (1911). The Pilgrims and Their Monument. New York: D. Appleton & Co.
Cheever, G. B. (1848). The Journal of the Pilgrims at Plymouth. In New England, in 1620: Reprinted from the Original Volume. With Historical and Local Illustrations of Providences, Principles, and Persons (Second edition). New York: John Wiley. Clifton, R. (2004). Christopher Monck, second duke of Albemarle. In H. C. G. Matthew and B. Harrison (Eds.). Oxford Dictionary of National Biography, vol. 38 (pp. 578-579). New York: Oxford University Press. Cohen, B. H. (2001). Explaining Psychological Statistics, Second Edition. New York: John Wiley. Commager, H. S. (1935). Documents of American History, Volume 1 to 1865. New York: F. S. Crofts. Commager, H. S. and Cantor, M. (1988). Documents of American History, Volume 1 to 1898 (Tenth edition). Englewood Cliffs, NJ: Prentice Hall. Constitution of the United States: Magna Carta, Mayflower Compact, Declaration of Rights, Declaration of Independence, Articles of Confederation. Constitution of the State of California, as Last Amended November 3, 1970. Constitutional History of California; Constitution Revision Commission; Act for the Admission of California into the Union. (1971). [Sacramento, CA:] Legislature Assembly. Davis, J. (1826). New England’s Memorial, Fifth Edition. Boston, MA: Printed by Crocker and Brewster. Davis, W. T. (1908). Bradford’s History of Plymouth Plantation, 1606-1646. New York: Charles Scribner’s Sons. Dexter, H. M. (1865/1969). Mourt’s Relation or Journal of the Plantation at Plymouth, with an Introduction and Notes. New York: Garrett Press. Fraikin, J. (1996). Was Joan of Arc a “sign” of Charles VII’s innocence? In B. Wheeler and C. T. Wood (Eds.). Fresh Verdicts on Joan of Arc (pp. 61-72). New York: Garland Publishing. Gehring, C. T.; Starna, W. A.; and Fenton, W. N. (1987). The Tawagonshi treaty of 1613: The final chapter. New York History 68, 373-393. Ginsca, A.-L. and Iftene, A. (2010). Using a genetic algorithm for optimizing the similarity aggregation step in the process of ontology alignment. Ninth IEEE Romanian Educational Network (Roedunet) International Conference (pp. 118-122). Sibiu, Romania: Romanian Educational Network. Goodwin, J. A. (1888). The Pilgrim Republic: An Historical Review of the Colony of New Plymouth with Sketches of the Rise of Other New England Settlements, the History of Congregationalism, and the Creeds of the Period. Boston, MA: Ticknor and Co.
Harding, L. (2012). The Pacific island that never was. The Guardian, 22 November 2012, and accessed here on 23 November 2012. Harris, T. (2004). Anthony Ashley Cooper, first earl of Shaftesbury. In H. C. G. Matthew and B. Harrison (Eds.). Oxford Dictionary of National Biography, vol. 13 (pp. 199-217). New York: Oxford University Press. Haxtun, A. A. (1897). Signers of the Mayflower Compact. [New York:] The Mail and Express Co.
Human Documents: The Mayflower Compact; Declaration of Independence; Constitution of the United States; Constitutional Amendments; Gettysburg Address. (1926). East Aurora, NY: The Roycrofters. Hutchinson, T. (1767). The History of the Province of Massachusets-Bay, From the Charter of King William and Queen Mary, in 1691, Until the Year 1750. Boston, New-England: Printed by Thomas & John Fleet. Johnson, C. H. (2006). The Mayflower and Her Passengers. [Philadelphia, PA:] Xlibris. Jones, D. V. (1988). British colonial Indian treaties. In W. C. Sturtevant and W. W. Washburn (Eds.). Handbook of North American Indians, vol. 4: History of Indian-White Relations (pp. 185-194). Washington, DC: Smithsonian Institution. Kavenagh, W. K. (1973). Foundations of Colonial America: A Documentary History, vol. 1. New York: Chelsea House. Kukich, K. (1992). Techniques for automatically correcting words in text. ACM Computing Surveys 24, 377-439. Landing of the Pilgrims at Provincetown, Mass. (1904). Senate. 58th Congress, 2nd session. Senate Report No. 1359 (Serial Set 4573). Washington, DC: Government Printing Office. Lester, C. E. (1883). Lester’s History of the United States. Illustrated in its Five Great Periods: Colonization, Consolidation, Development, Achievement, Advancement, volume I. New York: P. F. Collier. Levenshtein, V. I. (1966). Binary codes capable of correcting deletions, insertions, and reversals. Soviet Physics Doklady 10, 707-710. Malone v. State, 630 S.W.2d 920 (1981). Mandell, D. R. (2003). Early American Indian Documents: Treaties and Laws, 1607-1789. Volume XIX: New England Treaties, Southeast, 1524-1761 (pp. 23-27). Bethesda, MD: University Publications of America. Margolis, N. (1996). The “Joan phenomenon” and the French right. In B. Wheeler and C. T. Wood (Eds.). Fresh Verdicts on Joan of Arc (pp. 265-287). New York: Garland Publishing. Marshall, A. (2004). Henry Bennet, first earl of Arlington. In H. C. G. Matthew and B. Harrison (Eds.). Oxford Dictionary of National Biography, vol. 5 (pp. 101-105). New York: Oxford University Press. Mason, T. W. and Nightingale, B. (1920). New Light on the Pilgrim Story. London: Congregational Union of England and Wales. Memorial of the landing of the Pilgrims at Provincetown, Mass. (1903). House of Representatives. 57th Congress, 2nd session. House Report No. 3781 (Serial Set 4415). Washington, DC: Government Printing Office. Memorial of the landing of the Pilgrims at Provincetown, Mass. (1904). House of Representatives. 58th Congress, 2nd session. House Report No. 673 (Serial Set 4578). Washington, DC: Government Printing Office. Memorial of the landing of the Pilgrims at Provincetown, Mass. (1906). House of Representatives. 59th Congress, 1st session. House Report No. 3701 (Serial Set 4907). Washington, DC: Government Printing Office. Milontree v. State, 16 S.W. 764 (1891). Mitnick, B. J. (1985). Jean Leon Gerome Ferris, 1863-1930: American Painter Historian. Laurel, MS: Lauren Rogers Museum of Art. Morton, N. (1669). New-Englands Memoriall: Or, A Brief Relation of the Most Memorable and Remarkable Passages of the Providence of God, Manifested to the Planters of New-England in America; With Special Reference to the First Colony thereof, called New-Plimouth. As also a Nomination of Divers of the Most Eminent Instruments Deceased, Both of Church and Common-wealth, Improved in the First Beginning and After-Progress of Sundry of the Respective Jurisdictions in those Parts; In Reference unto Sundry Exemplary Passages of Their Lives, and the Time of Their Death. Published for the Use and Benefit of Present and Future Generations. By Nathaniel Morton, Secretary to the Court for the Jurisdiction of New-Plimouth. Cambridge: Printed by S. G. and M. J. for John Usher of Boston. Morton, N. (1721). New-England’s Memorial: Or, A Brief Relation of the Most Memorable and Remarkable Passages of the Providence of God, Manifested to the Planters of New-England in America; With Special Reference to the First Colony thereof, called New-Plimouth. As also a Nomination of Divers of the Most Eminent Instruments Deceased, Both of Church & Common Wealth, Improved in the First Beginning and After Progress of Sundry of the Respective Jurisdictions in those Parts: In Reference unto Sundry Exemplary Passages of Their Lives, & the Time of Their Death. Published for the Use and Benefit of Present and Future Generations. By Nathaniel Morton, Secretary to the Court for the Jurisdiction of New-Plimouth. Boston: Reprinted for Daniel Henchman. Morton, N. (1772). New-England’s Memorial: Or, A Brief Relation of the Most Memorable and Remarkable Passages of the Providence of God, Manifested to the Planters of New-England, in America; With Special Reference to the First Colony thereof, called New-Plymouth. As also a Nomination of Divers of the Most Eminent Instruments Deceased, Both of Church & Common Wealth, Improved in the First Beginning, and After Progress of Sundry of the Respective Jurisdictions in those Parts: In Reference unto Sundry Exemplary Passages of Their Lives, & the Time of Their Death. Published for the Use and Benefit of Present and Future Generations. By Nathaniel Morton, Secretary to the Court for the Jurisdiction of New-Plymouth. Boston: Reprinted for Daniel Henchman. Morton, N. (1826a). New England’s Memorial: By Nathaniel Morton, Secretary to the Court, for the Jurisdiction of New-Plimouth. Fifth Edition. Containing besides the Original Work, and the Supplement Annexed to the Second Edition, Large Additions in Marginal Notes, and an Appendix; with a Lithographic Copy of an Ancient Map. Boston: Printed by Crocker and Brewster. Morton, N. (1826b). The New-England’s Memorial: Or, A Brief Relation of the Most Memorable and Remarkable Passages of the Providence of God, Manifested to the Planters of New-England, in America: With Special Reference to the First Colony thereof, called New Plymouth. As also a Nomination of Divers of the Most Eminent Instruments Deceased, Both of Church and Commonwealth, Improved in the First Beginning, and After Progress of Sundry of the Respective Jurisdictions in those Parts: In Reference unto Sundry Exemplary Passages of Their Lives, and the Time of Their Death. Published for the Use and Benefit of Present and Future Generations. By Nathaniel Morton, Secretary to the Court for the Jurisdiction of New Plymouth. Plymouth, MA: Reprinted by Allen Danforth. Morton, N. (1855). New England’s Memorial: By Nathaniel Morton, Secretary to the Court for the Jurisdiction of New-Plimouth. Sixth Edition. Also Governor Bradford’s History of Plymouth Colony; Portions of Prince’s Chronology; Governor Bradford’s Dialogue; Gov. Winslow’s Visits to Massasoit; with Numerous Marginal Notes and an Appendix, Containing Numerous Articles Relating to the Labors, Principles, and Character of the Puritans and Pilgrims. Boston: Congregational Board of Publications. Mulcaster, R. (1582/1970). The First Part of the Elementary, 1582. Menston, UK: Scolar Press. Nicholls, M. and Williams, P. (2004). Sir Walter Ralegh. In H. C. G. Matthew and B. Harrison (Eds.). Oxford Dictionary of National Biography, vol. 45 (pp. 842-859). New York: Oxford University Press. Nickerson, W. S. (1931). Land ho! — 1620. A Seaman’s Story of the Mayflower: Her Construction, Her Navigation and Her First Landfall. New York: Houghton Mifflin. Paget, H. (1920). Bradford’s History of the Plymouth Settlement, 1620-1650. New York: E. P. Dutton & Co.
Parrington, V. L. (1927). Main Currents in American Thought, volume 1. New York: Harcourt, Brace, and World. Pencak, W. (2004). John Hancock. In H. C. G. Matthew and B. Harrison (Eds.). Oxford Dictionary of National Biography, vol. 25 (pp. 16-18). New York: Oxford University Press. Philbrick, N. (2006). Mayflower: A Story of Courage, Community, and War. New York: Viking. Pleck, E. (1999). The making of the domestic occasion: The history of Thanksgiving in the United States. Journal of Social History 32, 773-789. Poore, B. P. (1878a). The Federal and State Constitutions, Colonial Charters, and Other Organic Laws of the United States (Second edition), volume 1, part 3. Washington, DC: Government Printing Office. Poore, B. P. (1878b). The Federal and State Constitutions, Colonial Charters, and Other Organic Laws of the United States (Second edition), volume 2. Washington, DC: Government Printing Office. Preston, H. W. (1886). Documents Illustrative of American History: 1606-1863. New York: G. P. Putnam’s Sons. Prince, T. (1736). A Chronological History of New-England in the Form of Annals: Being a Summary and Exact Account of the Most Material Transactions and Occurrences Relating to this Country, in the Order of Time Wherein They Happened, From the Discovery by Capt. Gosnold in 1602, to the Arrival of Governor Belcher, in 1730. With an Introduction, Containing a Brief Epitome of the Most Remarkable Transactions and Events Abroad, from the Creation: Including the Connected Line of Time, the Succession of Patriarchs and Sovereigns of the Most Famous Kingdoms & Empires, the Gradual Discoveries of America, and the Progress of the Reformation to the Discovery of New-England. Boston, N.E. : Printed by Kneeland & Green for S. Gerrish. Prince, T. (1826). A Chronological History of New-England in the Form of Annals: Being a Summary and Exact Account of the Most Material Transactions and Occurrences Relating to this Country, in the Order of Time Wherein They Happened, From the Discovery by Capt. Gosnold, in 1602, to the Arrival of Governor Belcher, in 1730. With an Introduction Containing a Brief Epitome of the Most Remarkable Transactions and Events Abroad, from the Creation. Including the Connected Line of Time, the Succession of Patriarchs and Sovereigns of the Most Famous Kingdoms and Empires; the Gradual Discoveries of America, and the Progress of the Reformation, to the Discovery of New-England. [Boston, MA:] Cummings, Hilliard, and Co. Prince, T. (1887). The New England chronology, part 1, continued. In Bibliotheca Curiosa. A Chronological History of New England, in the Form of Annals, vol. 1. Edinburgh: Privately printed. Provincetown memorial. (1896). Provincetown, MA: Cape Cod Memorial Association of Provincetown. Rich, E. E. (1942). Minutes of the Hudson’s Bay Company, 1671-1674. Toronto: The Champlain Society. Salisbury, N. (1985). The colonizing of Indian New England. Massachusetts Review 26, 447-460. Salwen, B. (1978). Indians of southern New England and Long Island: Early period. In W. C. Sturtevant and B. G. Trigger (Eds.). Handbook of North American Indians, vol. 15: Northeast (pp. 160-176). Washington, DC: Smithsonian Institution. Sargent, M. L. (1988). The conservative covenant: The rise of the Mayflower compact in American myth. New England Quarterly 61, 233-251. Schäfer, J. (1970). The orthography of proper names in modern-spelling editions of Shakespeare. Studies in Bibliography 23, 1-19. Snow, D. R. and Lanphear, K. M. (1988). European contact and Indian depopulation in the northeast: The timing of the first epidemics. Ethnohistory 35, 15-33. Soukoreff, R. W. and MacKenzie, I. S. (2001). Measuring errors in text entry tasks: An application of the Levenshtein string distance statistic. Companion Proceedings of the ACM Conference on Human Factors in Computing Systems — CHI 2001 (pp. 319-320). New York: Association of Computing Machinery. Status of Puerto Rico. (1966). Senate. 89th Congress, 2nd session. Senate Document No. 108, vol. 1 (Serial Set 12719-1). Washington, DC: Government Printing Office. Stith, W. (1753). The History of the First Discovery and Settlement of Virginia. Virginia, printed: London, reprinted for S. Birt. Sullivan, K. (1999). The Interrogation of Joan of Arc. Minneapolis, MN: University of Minnesota Press. Swanton, J. R. (1952). The Indian tribes of North America. House of Representatives. 81st Congress, 2nd session. House Document No. 383 (Serial Set 11475). Washington, DC: Government Printing Office. Takahashi, S. and Izumi, T. (2006). Travel time measurement by vehicle sequence matching method — Evaluation method of vehicle sequence using Levenshtein distance. SICE-ICASE, 2006 International Joint Conference, 1625-1629. Tennison, J. (2007). Levenshtein distance on the diagonal. Accessed at http://www.jenitennison.com/blog/node/12 on 13 November 2012. Thacher, J. (1832). History of the Town of Plymouth; From Its First Settlement in 1620, to the Year 1832. Boston, MA: Marsh, Capen & Lyon. Thacher, J. (1835). History of the Town of Plymouth, From Its First Settlement in 1620, to the Present Time: With a Concise History of the Aborigines of New England, and Their Wars with the English, &c. Boston, MA: Marsh, Capen & Lyon. The Constitution of the United States of America: Analysis and Interpretation. (2004). Senate. 108th Congress, 2nd session. Senate Document No. 108-17 (Serial Set 14866). Washington, DC: Government Printing Office. The Oxford English Dictionary. (1989). Oxford: Clarendon Press. Thorpe, F. N. (1909a). The Federal and State Constitutions: Colonial Charters, and Other Organic Laws of the States, Territories, and Colonies Now or Heretofore Forming the United States of America. Vol. III: Kentucky-Massachusetts. Washington, DC: Government Printing Office. Thorpe, F. N. (1909b). The Federal and State Constitutions: Colonial Charters, and Other Organic Laws of the States, Territories, and Colonies Now or Heretofore Forming the United States of America. Vol. VII: Virginia-Wyoming-Index. Washington, DC: Government Printing Office. Townsend, J. G. (1938). Disease and the Indian. Scientific Monthly 47, 479-495. Travers, L. (2004a). Edward Winslow. In H. C. G. Matthew and B. Harrison (Eds.). Oxford Dictionary of National Biography, vol. 59 (pp. 757-759). New York: Oxford University Press. Washburn, W. E. (1976). The historical context of American Indian legal problems. Law and Contemporary Problems 40, 12-24. Whittemore, H. (1899). The Signers of the Mayflower Compact and Their Descendants. New York: Mayflower Publishing. Wills, A, B. (2003). Pilgrims and progress: How magazines made Thanksgiving. Church History 72, 138-158. Winsor, [J. ]; Winthrop, R. C; and Tuttle, C. W. (1877). November meeting, 1877. Different spelling of Ralegh’s name. Proceedings of the Massachusetts Historical Society 15, 380-385. Young, A. (1841). Chronicles of the Pilgrim Fathers of the Colony of Plymouth, from 1602-1625. Now First Collected from Original Records and Contemporaneous Printed Documents, and Illustrated with Notes. Boston, MA: Charles C. Little and James Brown. Young, A. (1844). Chronicles of the Pilgrim Fathers of the Colony of Plymouth, from 1602-1625. Now First Collected from Original Records and Contemporaneous Printed Documents, and Illustrated with Notes (Second edition). Boston, MA: Charles C. Little and James Brown. Zini, M.; Fabbri, M.; Moneglia, M.; and Panunzi, A. (2006). Plagiarism detection through multilevel text comparison. Second International Conference on Automated Production of Cross Media Content for Multi-Channel Distribution (pp. 181-185). Washington, DC: IEEE Computer Society. We would like to thank Rebecca Levin, of the Provincetown Public Library in Massachusetts, for providing historical data on the creation and installation of the Memorial Stone from which this study took the text and names arrays designated as Provincetown. As in our other projects, we are indebted to Michael Black of the Department of Statistics at the University of Nebraska-Lincoln for providing advice during the preparation of this article, and to Laura Weakly and Karin Dalziel of the Center for Digital Research in the Humanities at the University of Nebraska-Lincoln for technical assistance: their help is gratefully acknowledged. 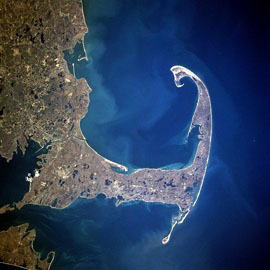 The thumbnail and Figure 1 of Cape Cod were made available by the Image Science and Analysis Laboratory of the National Aeronautics and Space Administration’s Johnson Space Center and are part of The Gateway to Astronaut Photography of Earth collection; we thank the Laboratory for allowing us to use this graphic for this study. Finally, we thank Tim Jackson for sending a postcard to the first author that revealed the text and signatories (absent honorifics) of the Compact. Without that note, this analysis would not have taken life. In the name of God, Amen. We whose names are under-written, the loyal subjects of our dread soveraign Lord King James, by the grace of God of Great Britain, France, and Ireland, King, Defendor of the Faith, &c. Having undertaken for the glory of God, and advancement of the Christian faith, and the honour of our King and Countrey, a voyage to plant the first colony in the northern parts of Virginia; do by these presents solemnly and mutually, in the presence of God and one another, covenant and combine our selves together into a civil body politick, for our better ordering and preservation, and furtherance of the ends aforesaid; and by virtue hereof do enact, constitute and frame such just and equal laws, ordinances, acts, constitutions and officers, from time to time, as shall be thought most meet and convenient for the general good of the Colony; unto which we promise all due submission and obedience. In witness whereof we have hereunto subscribed our names at Cape Cod, the eleventh of November, in the reign of our soveraign Lord King James, of England, France and Ireland the eighteenth, and of Scotland the fifty fourth. Anno Dom. 1620.